The ruins of this eastern han, located on the caravan route to Iran, reveal a rare plan of a covered section only with three naves. The Tatvan Han is located 5 km from the Tuğ district of Tatvan. It is built on the historical caravan route between Bitlis and Tatvan. A modern highway passes over the caravan route, which follows the banks of the river which flows through the valley. Many caravanserais, known as "duhan" ("Tobacco hans"), were built in the Ottoman period along this route, which was a busy road during the Ottoman period, especially for merchants heading to Iran. As there is no inscription, the construction date and the patron of this han are known. The first examples of this plan type, built from the 12th to the 14th centures, are the Kuru Han between Kayseri and Elbistan and the Babşin Han which is near to the Tatvan Han. Taking into consideration the other hans built during this period, a time when the caravan routes in the region were heavily used, this han must have been completed at the beginning of the 13th century at the latest. The han is oriented east-west and the front of the han faces the road. The han is now almost completely buried below ground level and its walls are in ruins. It has a plan comprising a covered section with three naves covered by pointed vaults. There is no trace of a courtyard. The vaults are carried by two support walls and backed by pointed arches in the east-west direction. 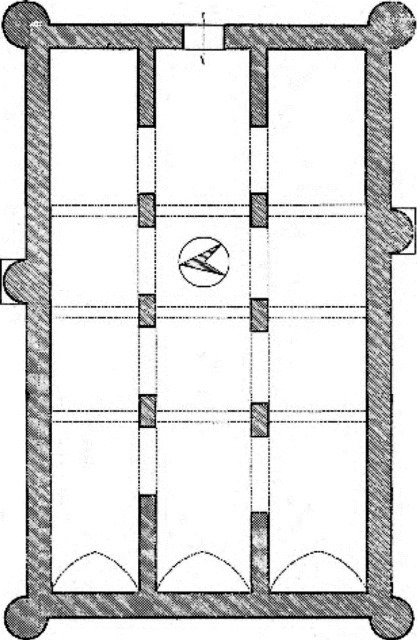 The middle nave was higher and wider than the side naves. The arches and piers of each support line of the naves have, unfortunately, substantially collapsed. The piers were formerly connected to each other by horizontal arches in the north-south direction. The interior spaces were lit by slit windows, one over the entrance door and the others in each nave on the east wall. Circular support towers are located at the corners of the north and south side walls, and are not placed opposite each other. The walls of the han were made of pitch-faced stone. Smooth-faced stones were used in the arches and piers. The walls are double-faced and filled with mud, small stones and mortar. No traces of a mosque or any decoration has been uncovered. The inscription plaque has been lost. Many hans with three naves exist in Seljuk architecture, such as the Kuruçeşme, Kizilören, Altinapa, Paşa, Çekereksu and Kadin Hans. However, these hans are examples of the combined plan with a courtyard and a covered section. The Kuru Han on the Kayseri-Elbistan caravan route is one of the rare examples of a han with a covered section only comprising three naves. The han is in complete ruins today. The contours of the han were more visible until recently, up until the time the standing sections were subdivided by walls to be used as a barn and a hayloft. This transformation caused substantial damage to the building: the roof collapsed and the outer walls have been stripped of their stones and cladding. The important parts of the wall system separating the naves have been lost. Eravşar, Osman. Yollarin Taniklari (Witnesses of the Way), 2017, pp. 131-133. Ünal, R.H. "Doğu Anadolu’da Bilinmeyen Üç Selçuklu Hani". Arkeologi-Sanat Tahrihi Dergisi, II, 1983, p. 106-118.